There is something amazing about the Arabian horse scene. Of course, they are the most astounding, most beautiful horses in the world. But you can easily learn so much about other people and foreign countries and cultures, too. For example, recently I have learned some interesting facts about Bahrain. Did you know that in Arabic, Bahrayn is the dual form of Bahr (sea), so al-Bahrayn means ‘the two seas’. In fact, Bahrain is an archipelago of 33 islands. Though the modern state is quite young the civilization in Bahrain dates back to antiquity and became a cradle for our beloved Arabian horses. Even though it is interesting to learn more about the countries where the Arabian Horse Global Network is working, the particular focus of our blog posts is on Arabian horses. Let’s look at the championships of the 2nd edition of the International Arabian Horse Show held in Bahrain International Endurance Village, Zallaq, and hosted by the Bahrain Royal Equestrian and Endurance Federation. The Federation invited a panel of experienced judges: Anette Dixon, Tomasz Tarczynski, Koenraad Detailleur, Talal Al Mehri and Dhari Abdul Mohsen Al Mejhem. The first day was reserved for the females and the first championship decision was made for the yearling fillies. Nayla Almaha (Nibras x Nouf Almaha), bred by Al Maha Stables and owned by Osama Abdulla Ahmed Al-Haram, Bahrain, won handsomely Gold Champion Yearling Filly after winning her class. Silver went to the Tabaque daughter Aaku Shaikha of Aali Stud, Bahrain with Bronze winner Yasmeen Al Gadeer, by Al Ayham, owned by Jafaar Husain Abdulla Al Qattan, Bahrain. The QR Marc daughter Magnum’s Fortune K.A. (out of the Magnum Psyche daughter FS Magnum Madonna) received the highest points of all fillies and the title of the Unanimous Gold Champion Junior Filly. Born inside Knocke Arabians, Belgium, this filly belongs to Sheikha Muna Saleh Al-Rashed, Bahrain. 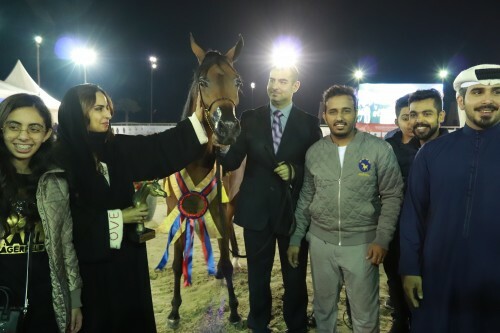 Bred by Ajman Stud but owned by Alaa Abdul Jabaar Ahmed Isa Hammad, Bahrain, the AJ Portofino daughter Aluia Al-Ameer won Silver while Abdul Rahman Mohamed Abdulla Mohammed Al Jabaar received Bronze for his Suhal Al Nasser daughter Mona Al Rashediah. The senior mare classes were well filled with lovely individuals. 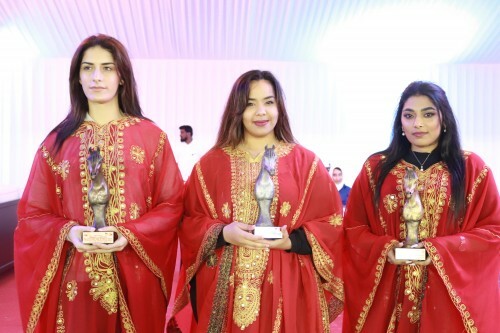 Taking home the award for Gold Champion Senior Mare was D Kaseeba (QR Marc x Kastilia MAF), bred by Dubai Arabian Horse Stud and owned by Saeed Jaffar Abdulla Mohamed Alma, Bahrain. A little surprise for some spectators, maybe. D Kaseeba was second in her class bested only by D Leyanah, the high scorer of all females at this show. During the championship, the events took place in reverse order. Al Nawader Arabians’ D Leyanah, sired by Marajj and out of Muranas Paloma, was named Silver Champion Senior Mare. Joining these fine ladies was the winner of the second senior mare class, Janow Podlaski bred Eustomia, by Poganin, owned by Abdullah Yousif Ahmed Mohammed. The second day of the show was preserved for the colts and stallions. Again, the yearlings were the first ones who rose in the ring. And again the high scorer of all yearling colts won the championship: Ashqar Al Dar (Design For Life x QR Samantha). His delighted owner Ali Abdalkareim Abdalmajeed Al Kater of Saudi Arabia accepted the trophy for the Gold Champion Yearling Colt. The Silver Champion Junior Colt was Muheeb Al Rashediah, a son of famous Jamil Al Rayyan, bred by Al Rashediah Stud. It was the second medal for Muheeb’s proud owner while Abdul Rahman Mohamed Abdulla Mohammed Al Jabaar. Completing the trifecta of champions was the Bronze Champion Junior Colt, Kyan Al Layal, by Kohinoor, bred by Al Layal Stud and owned by Mohsen Ali Abdulla Husain. A striking performance showed Qotob Al Shaqab, a son of Fadi Al Shaqab out of Shama Al Shaqab, bred by Al Shaqab Stud, Qatar. His dam Shama Al Shaqab is a granddaughter of the influential Kajora, who also brought Gazal Al Shaqab. Qotob Al Shaqab recently won Gold Champion Junior Colt at the 8th Bahrain National Arabian Horse Festival for his proud owner Al Nawader Arabians, Bahrain, and showed his best side at the international show, too. The judges honoured him with the highest score of all males and Gold Champion Junior Colt. The Silver winner was the RFI Farid son Aali Farid, bred by Ajman Stud and owned by Ali Abdulla Ali Alaali, Bahrain, while D Abraq, by BS Raeed, received Bronze after winning the class of the two years old colts. D Abraq is bred by Dubai Arabian Horse Stud and owned by Khalil Ebrahim Ali Mukhtar, Bahrain. Completing the Championships were the senior stallions with a unanimous decision. The Gold Champion Senior Stallion was awarded to D Jad (Frasera Mashar x Muranas Je Taime) bred by Dubai Arabian Horse Stud and owned by Khalil Ebrahim Ali Mukhtar, Bahrain. Earning the title of Silver Champion was SL Kasjmir, by Psytadel. This stallion was bred by Nicole Vaessen, Netherlands, and is owned by Nasseem Abdulla Al Mohanna. I remember him very well because I wrote about him in one of my very first blog posts for Arabian Horse Global Network. Forgive me this nostalgic flavour, back to the Bronze Champion Senior Stallion. It was another QR Marc son bred by Dubai Arabian Horse Stud that took away Bronze: D Fayez, owned by Sami Hasan Abdulla Abdulaziz, Bahrain. Congratulations to all of the competitors and a very sincere thank you to the incredible support of the organizing team of the Bahrain Royal Equestrian and Endurance Federation. Arabian Horse Global Network would like to extend our thanks for the excellent collaboration.